I wanted the rustic reds, blues, and whites in various patterns and textures. With the food inspired by the lyrics in the opening title song “Belle”. For the center piece, there is this gorgeous hand-drawn sign from Gable Fox Design, one of my dearest friends and lettering artist extraordinaire! It features Belle’s books in her basket, her village, and the words from the song “Belle”, “Bonjour! Good Day!” – which also fits in perfectly with the brunch theme! For the napkins, I rolled silverware in scraps of square fabric that were red, white, and blue, like her dress in the film. To give it a more rustic look, I made sure to use different patterns of fabric, and then wrapped together with a string of twine. For the tablecloth, I used a quilt that belonged to my grandfather – who was like my “papa” – so this was the perfect way to incorporate some personal meaning into my party set up! And how amazing is it that this quilt that’s been in my family for decades is so reminiscent of Belle’s dress from the live action movie? You yourself could use any gingham tablecloth, or a rustic looking table runner. I put out a basket of rustic bread and rolls (“Bread and rolls to sell”), complete with raspberry preserves and butter (very French). 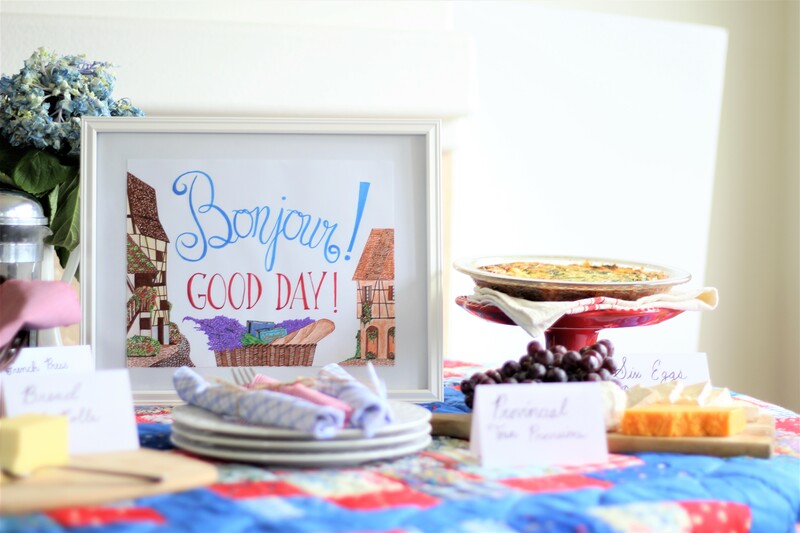 I also had on my spread a Provincial Town Provisions plate – a wooden cutting board with rustic French foods: Grapes, and a variety of cheeses. For the Beauty and the Beast brunch party beverage, I had a pot of fresh French press coffee. For the main entree of the brunch party, I created an original recipe: A six eggs quiche (“I need six eggs!”). The good thing though? To make this dish it isn’t “Too expensive”. 🙂 You can get the full recipe here. I had such a fun time putting this Beauty and the Beast Brunch party together in anticipation for the live action film release on March 17th!